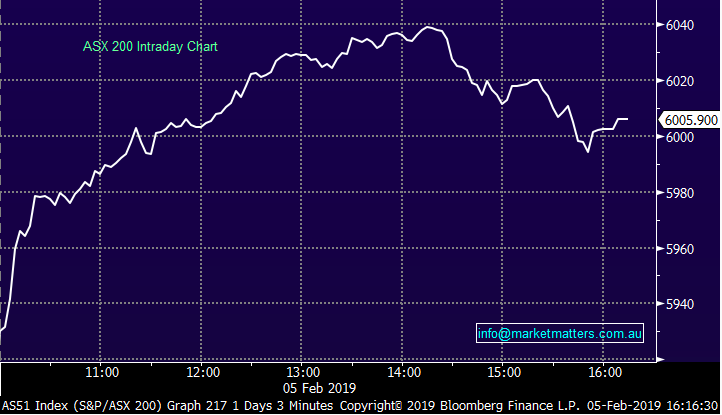 Bang…some massive pent up buying / or short covering, probably both playing out in the banking space today as the market clearly voted with its feet, jumping boots and all back into the banks. Of the ~114pts added to the market today, ~67pts came from the banking complex. 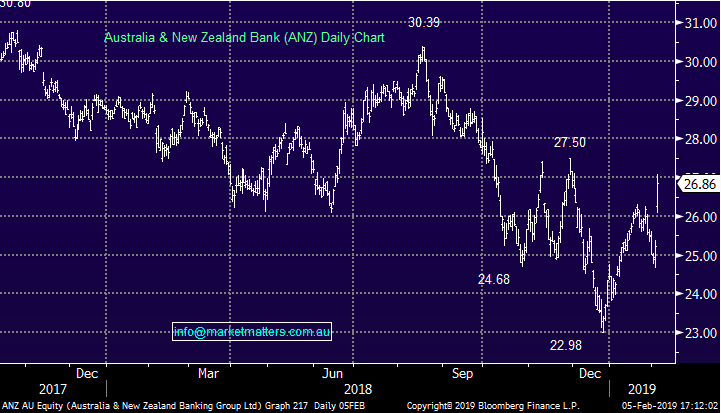 While the recommendations from the RC were less onerous than perhaps some in the mkt were expecting, ANZ up +6.5%, CBA +4.69%, NAB +3.91% & WBC +7.36% is clearly a big reaction. Short interest had been building steadily in the banks for a while - WBC for instance had around ~40m shares short in October rising to around ~70m shares at the end of January. The value of trade in the banks today was simply massive, CBA & WBC traded nearly $600m, NAB and ANZ nearly $350m a piece. 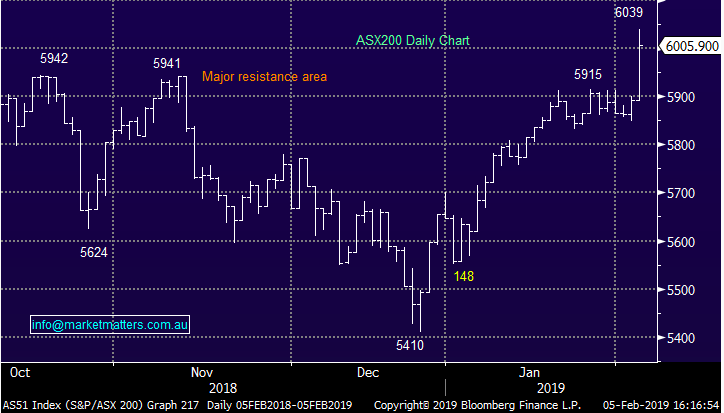 So, shorts being the highest in around 2 years, less bad news from the banking RC got buying in early today and as you can see from the chart below, it was sustained for most of the session. 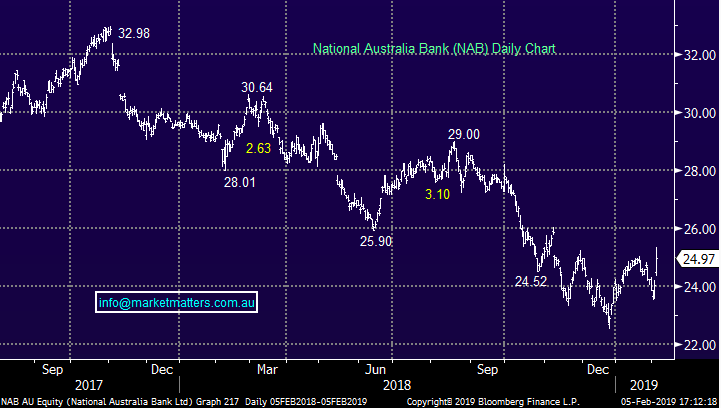 While we’re overweight the banks and have been for a while, our base case being that the negativity around the RC was baked in, the rally today was massive and I think disproportionate to what has changed. The short thesis on the banks (I thought) was around real-estate prices and loan growth – not much has changed there. While vertical integration stays under the new regime, that’s really only relevant for WBC now. Our incoming PM Bill Shorten has made it abundantly clear his focus remains to go hard on the banks as an election issue and that will still be a headwind for them. Ultimately, I think we’ve now seen the lows in the banks, they’ll grind up from here, however it’s not all clear air as todays price action implies. Higher lows should be bought, but buying such extreme strength as we saw today should be avoided. 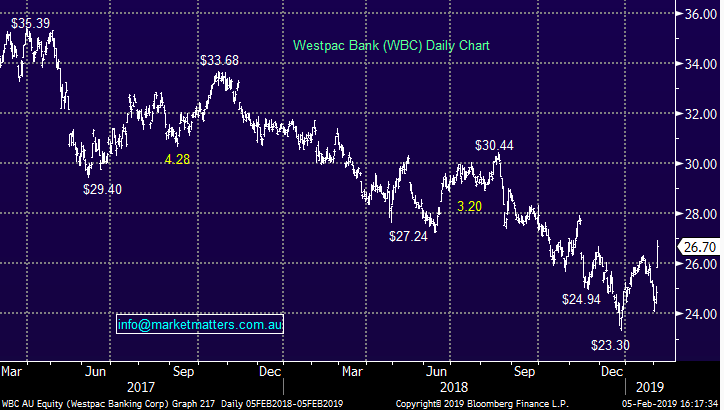 Banks; Hard to go past them today and they totally overshadowed the few earnings results that came across the ticker – here’s charts of the BIG 4 – which have just gotten bigger. Other stocks impacted by the Royal Commission (RC); Mortgage Choice (ASX:MOC) hit hard -25% on the RC news was the big casualty here – the stock has traded down from ~$3 to close today at 78.5c. 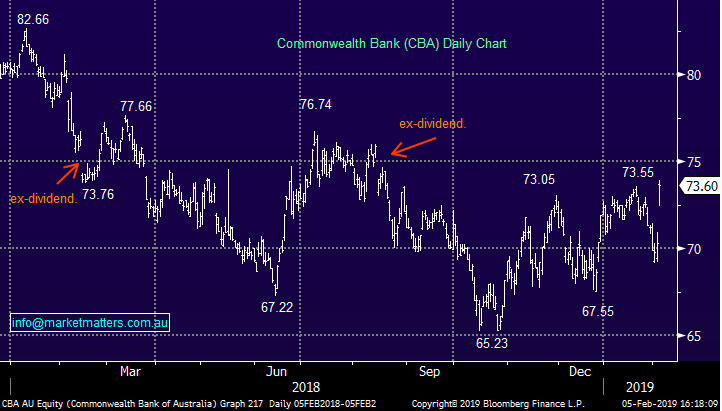 others to feel the pinch in the smaller space were GMY (-12.8%) & RMC (-7.7%) while freedom insurance (ASX:FIG) went into a trading halt which is scary. AMP and IFL rallied hard +9.95% and +7.99% respectively, mainly a consequence of vertical integration recommendations, however we’d still be a seller of any strength here. 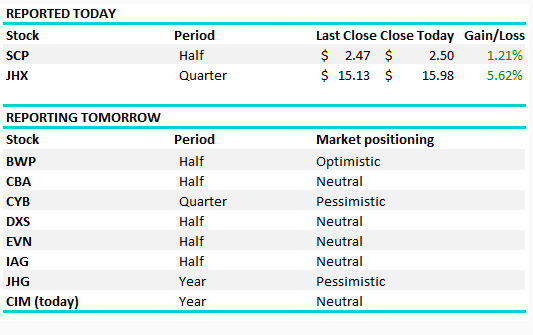 Janus (ASX:JHG) is set to report tonight in the US. We will be watching the reaction closely - the market has become so downbeat on the stock and won’t be asking a lot - it’s on an PE of 7.5x! The profit figure won’t be watched so much as costs, performance & fund flows data with any sign of a turnaround in outflow to be welcomed. It’s a self-help story that investors have lost faith in with this result being the next opportunity to show the market the ship is turning. Bond King Bill Gross retired from JHG last night, however his performance was weak in recent times – he was effectively managing the $700m of his own capital. 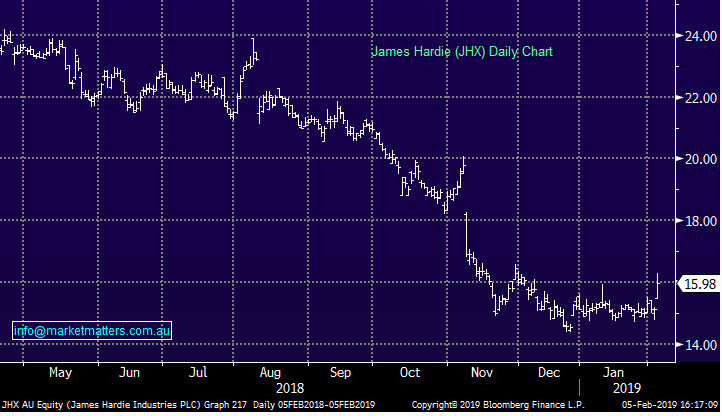 James Hardie (ASX: JHX) +5.62%; the construction material company’s 3rd quarter result was watched closely this morning following the downgrade by peer player Boral (ASX: BLD) yesterday, and it appears Hardies has been less impacted by the issues that face Boral. The result was slightly below the same quarter of last year, but it showed the company performing well while the US housing market struggled. The market was not asking much at this result, trading on around 14x PE, the cheapest level in almost a decade and the numbers did enough to impress. Guidance for the full year was in line with expectations, with management guiding to $US295m to $US315m vs the market at $US306m for the March year end. Perhaps investors were just pleased it didn’t follow Boral’s lead. The company did note an accelerating squeeze in margins, which fell 3.5% points over the quarter. This was driven by input costs however it continues to experience above market growth rates across its segments, with price increases helping to offset some of the added costs. Still, a decent final quarter will be required to hit their full year guidance. Cimic (ASX: CIM) $45.90; Just out after market with an inline result for their full year. No real surprises, top line was shy of expectations however margins clearly made up for the shortfall. Investors will be treated to a better than expected $0.86 fully franked final dividend. Guidance will be an issue when the stock opens up tomorrow, with FY19 profit looking a little light.